Have to brag on my Brittany Piper. I took her out in the field for her first actual hunt this past weekend. I've worked with her in the yard and on small pieces of land, but this was really putting it all together. She handled it like a champ! She retrieved to hand naturally and had a great time. When the dove got slow I walked the nearby field with her and she found 12 pheasant in the span of about 10 minutes. 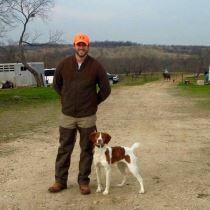 Can't wait to get behind her for pheasant season! Congratulations, nice looking dog, glad she performed as well as she looks. It is a wonderful feeling that makes all the hours training worthwhile. Ah, I am not being an amateur game warden, but you need to be mindful of comingling limits even for a photo OP. Hahah I appreciate the concern, it was for 5 people. No one wanted to be in the picture with bloody hands. Theres a total of 51 birds, so not even enough for 4 people to limit out. Wow, nice looking girl and sounds like a good time had by all! I too hunted dove this weekend going out with my adult son and his 9 year old daughter (My red headed Granddaughter). My son had scouted this area and found a wheat field that had recently been 'turned' by the farmer, which we had permission to hunt. The day he scouted, the field was covered up with dove. It also had a power line running through it with a large pond on the far end of the property. On Saturday morning the bird count was much lower than expected, but we did have some shots....my retriever was fairly upset at me as I only knocked down one bird, and then it got up and flew just before my pup got to it....?? Hunting was a bit slow, but a good time had by all. My Granddaughter told us both "we need more practice on shooting"....out of the mouths of babes....! haha that's okay, its not the bird numbers you bring home that really counts. It's all about the experience to me. Spending time out in the land with friends and family! 808allday wrote: Hahah I appreciate the concern, it was for 5 people. No one wanted to be in the picture with bloody hands. Theres a total of 51 birds, so not even enough for 4 people to limit out. I understand no one person was over the limit, you need to check on the meaning of comingling of game, Texas used to me really strict on it. What it says is that each person must keep their take separate, one can't shoot 10 and another 20 and be within the law. I am trying to help. It is silly, but if 4 of you were bad shots or just set in the shade, the other could have taken 75 birds. The game wardens have been known to watch at a distance with high power binoculars. Even if you shoot a 15-dove limit and have a great hunt, the elation goes south quickly if a game warden shows up and finds that you’ve done something illegal, maybe unintentionally. One of the most common tickets written for dove hunting is for co-mingling game, which means multiple people hunting together placing their birds in one pile, usually in an ice chest. The way to avoid this problem is by using zippered plastic bags and a permanent marker. Use the waterproof pen to write your name, the date and the number of birds on the plastic bag and then stash the birds on ice. Make sure each hunter in your party follows suit. Don’t give all the birds to the only guy smart enough to bring an ice chest, then divide the hunters into other vehicles. Your birds need to stay with you. Thanks Neil, I'll keep it in mind in the future. The last thing anyone wants is a ticket from the Warden. 808allday wrote: Thanks Neil, I'll keep it in mind in the future. The last thing anyone wants is a ticket from the Warden. Chances are good there would be no ticket, just a tusk tusk and don't do that again. Sorry I detracted from your rightful brag. The co-mingling thing can also be a problem in Missouri. Fortunately, I have never had a problem with it. Although, I do find it comical that wardens assume in a dove hunt with lots of folks hunting, that everyone knows exactly who shot what bird. It is fairly common for two people to shoot at the same bird, with one yielding to the other as to who actually killed the bird. If a warden was watching, not even he could not say who killed the bird. Regardless, always a great way to start the season, encouraging you to go out a practice some more prior to opening day! Actually, Neil's advice is spot on. There is some chance that a Texas Game Warden might give an admonishment rather than a ticket; however, if a Federal Game Warden is working and you are by chance encountered, you might have a huge problem. In this instance, they might decide the owner of the vehicle was the guilty party who shot in this case 36 birds in excess of the 15 bird limit. They could not only issue a citation, but could charge a "replacement fee" for each bird shot over the limit. I don't what the "replacement cost" of a dove is, but I am acquainted with a fellow who learned the replacement cost of a gadwall was $200.00 each. Keep your game separate, clean it separately, place the birds in a plastic bag with the name of the hunter who harvested the game on the bag. You will a glad you did if you ever get checked.